Who's ready for some football? Football food that is!! These Sausage and Peppers Hawaiian Roll Sliders are the perfect addition to your game day party menus. 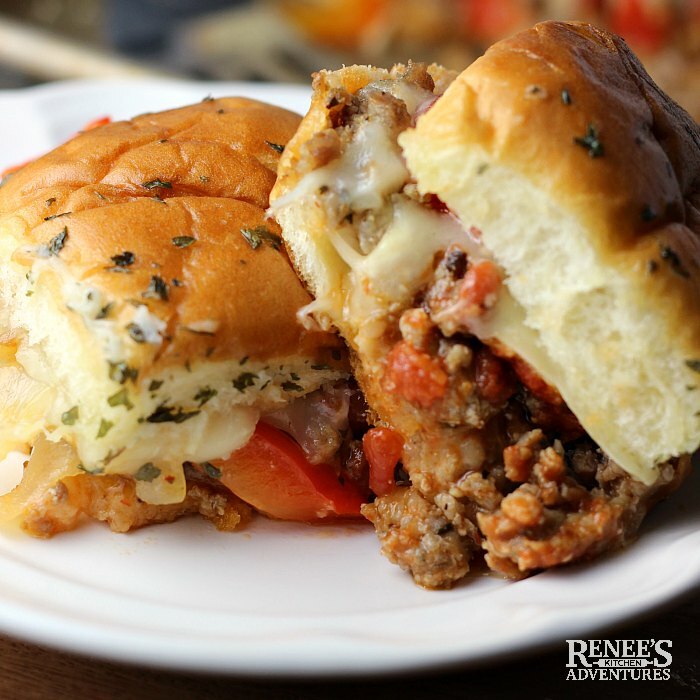 Hawaiian rolls are topped with cheese, Italian Sausage, sauteed peppers and onions, and more cheese for pull apart sliders that will earn you big points with your hungry fans! I'm not a huge sports fan. I am, however, a huge fan of Game day grub! And with the big game coming up this weekend, I know I'll be indulging in some fantastic football food! It's an excuse to eat just a little naughty. It's all about balance after all. Who doesn't love those oven baked sliders made with sweet Hawaiian rolls? Sure, they are sloppy and messy, but that ooey gooey goodness is what makes them so irresistible. 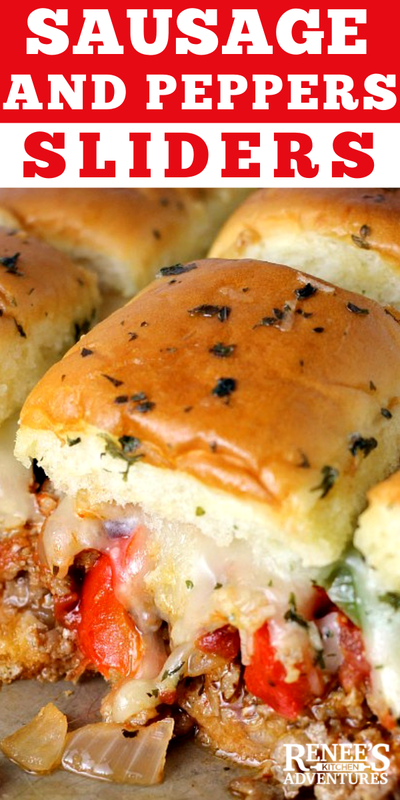 Sausage and Peppers Hawaiian Roll Sliders makes a great slider recipe for a crowd. How do you make sliders in the oven? 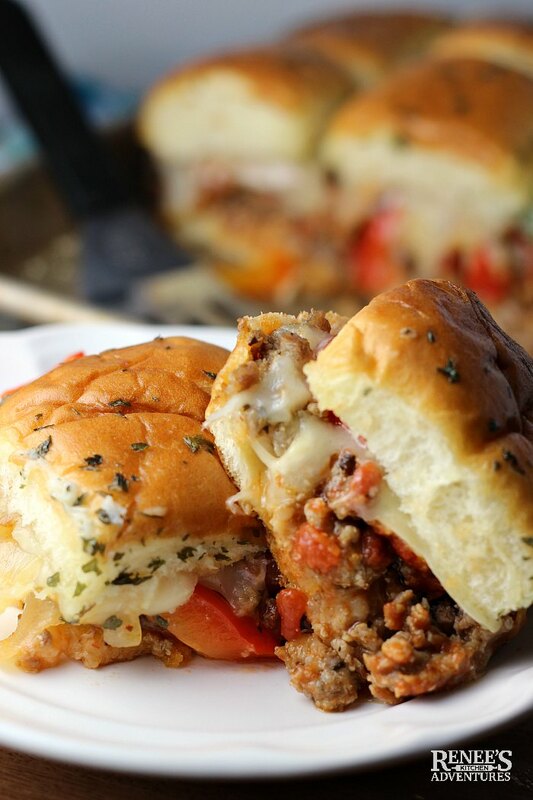 Hawaiian roll sliders baked in the oven, like these Sausage and Peppers Hawaiian Roll Sliders, aren't hard to make. I like make them in disposable aluminum pans if I'm taking them to a party, so I don't have to worry about clean up or bringing my pan home. To make sliders in the oven, split the Hawaiian rolls sheet in half, fill it, pour melted garlic butter on top, cover and bake for a few minutes in the oven. That's all there is to it! What sides to serve with sliders? These mini sandwich appetizers are a meal in themselves, but any kind of chip (potato, corn, etc.) would pair nicely with them. They're also great served with pasta salads like Roasted Vegetable Pasta Salad or Easy Broccoli Pasta Salad. Have all ingredients prepped and ready to make assembly easier. One word...cheese...don't skimp on it. You need it to hold everything together. These Sausage and Peppers Hawaiian Roll Sliders are the perfect thing to add to your game day party menus! 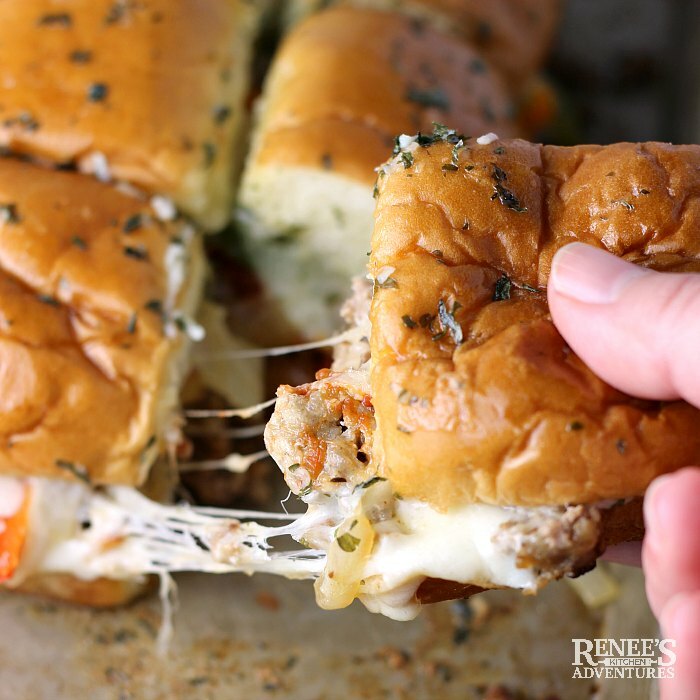 Hawaiian rolls are topped with cheese, Italian Sausage, sauteed peppers and onions, and more cheese for pull apart sliders that will earn you a touchdown with your hungry fans! 1 - 12 ct. package of Hawaiian rolls, whole package split in half so there is a top and a bottom. DO NOT PULL EACH ROLL APART. In large skillet, over med high heat, brown Italian sausage, breaking it up as it cooks. Remove to bowl with slotted spoon. Set aside. In same skillet, add onion and pepper. Cook on med high heat until onion is translucent and peppers are soft. Take off heat. Add sausage back in, along with marinara sauce and zesty Italian dressing. Stir to combine. Set aside. Place the bottom half of the rolls in a disposable aluminum 9 x 13 pan. (or any size that fits the entire bottom half of the rolls). Place 5 slices of provolone cheese (overlapping) on top of bottom of rolls. Spread sausage and peppers mixture evenly on top of provolone cheese. Place 5 slices of provolone cheese atop the sausage and peppers and Parmesan cheese mixture. Top with top half of rolls. In small bowl, combine the melted butter, garlic, and dried parsley. Brush over the tops of the rolls. Cover pan tightly with foil. Heat in oven for 15 to 20 minutes or until the sliders are heated through and the cheese is melted. Serve warm. 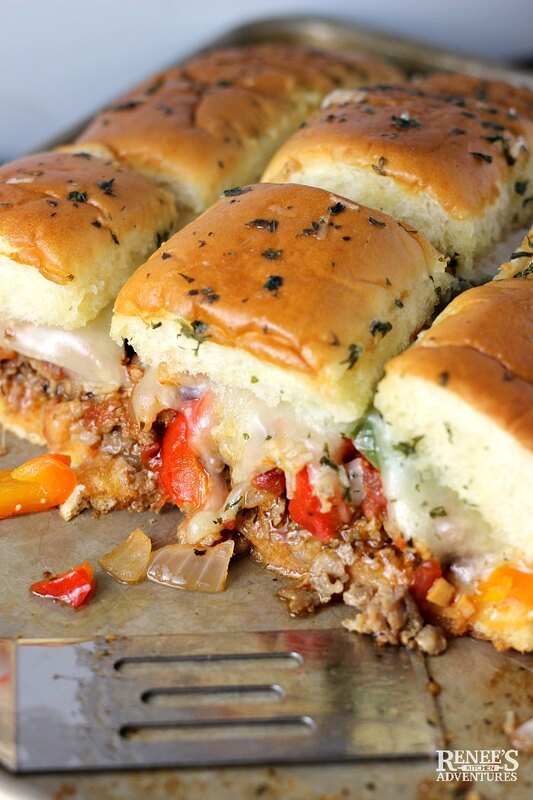 Pin Sausage and Peppers Hawaiian Roll Sliders to your Game Day boards! More Hawaiian Roll Slider recipes you might enjoy!